Dr. Sendi has served as Founder, President and Executive Medical Director of New Oakland Family Centers. He retired in 2013 and passed away in July 2015. He will be missed by the New Oakland family. Dr. Sendi was a board-certified child, adolescent and adult psychiatrist. He was established and developed New Oakland’s FACE to FACE Crisis Intervention and day treatment program and continuum of care approach. Throughout his career, Dr. Sendi was among the leading voices in Michigan’s mental health community advocating for the unique needs and rights of children and teens in the state’s public and private mental health systems. 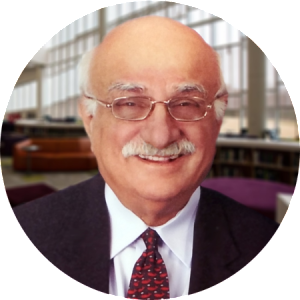 From 1971 through 1996, Dr. Sendi served as Director of Fairlawn Center in Oakland County one of the State of Michigan’s nationally recognized public mental health facilities for children and teens. In the 1990s, Dr. Sendi founded New Oakland Family Centers, a private-sector organization that has sought to continue and build upon Dr. Sendi’s public sector work and experience. Today, New Oakland Family Centers has six facilities in southeastern Michigan serving the mental health needs of adults, teens, children and families. He also served the medical director for child and adolescent services at Havenwyck Hospital in Auburn Hills, Michigan. Dr. Sendi was among the first medical professionals in the United States to both study and develop therapies for children with autism and attention deficit hyperactivity disorder (ADHD) — therapies that have become standard approaches to child mental health. Dr. Sendi also developed a focus on family therapy and counseling that recognized the importance of involving the whole family dynamic in treatment — not just the member of the family showing mental symptoms of mental illness. Dr. Sendi was born in Iran where he attended university and medical school before moving to the United States in 1962 to begin his medical internship in in Pittsburgh, PA. He moved to Detroit in 1963 where he studied and completed his residency in psychiatry and later child and adolescent psychiatry at Detroit’s Lafayette Clinic — at the time, one of the nation’s leading psychiatric research and training institutions, closed in 1992 due to state funding cuts. Dr. Sendi remained in the Detroit area throughout his career. Dr. Sendi was a fellow of the American Orthopsychiatric Association, representing professionals from psychology, psychiatry, social work, sociology, nursing, and law who are concerned about the application of mental health research to the creation of humane social policy, the improvement of mental health practice in a manner consistent with human rights, and the prevention of mental health problems. He was also a fellow of the American Academy of Child Psychiatry, a member of numerous other psychiatric organizations and published author of both scientific and non-technical works on mental health.